When “Pirates of the Caribbean” came out years ago we watched it with our kids. I wasn’t initially enamored with the character Johnny Depp played – the notorious “Captain Jack Sparrow” – but eventually could enjoy parts of the film. One scene in particular must have struck a chord for our kids. Two misfit pirates were arguing, or explaining something to another pirate. Of course they each want to be the hero of their tale, so it begins with one recounting and the other interrupting frequently. Finally, the more dominant one silences the other pirate with the words, “I’m telling the story!” I guess in a home with 5 children they all, ok even my husband and I, felt like there were times we could not get a whole sentence out before someone interrupted. So, for quite some time this phrase was hollered out in desperation to be heard. And usually that line would allow the speaker to at least finish a sentence. Recently, I have begun reading a book highly recommended to me. 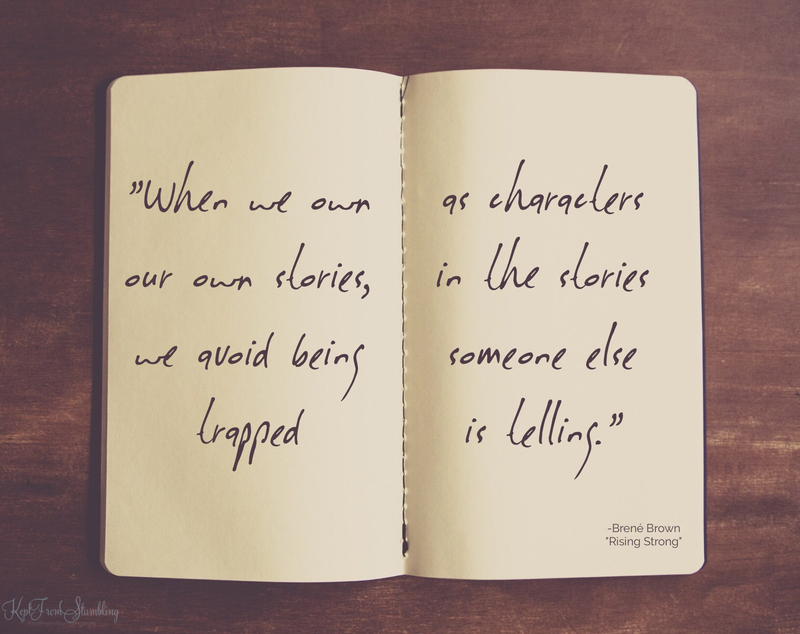 “Rising Strong” by Brene Brown. While I do believe she could have made her points just as well without some of the street language she uses, it is a well-researched and well-written piece on human nature. She has spent years researching, interviewing, and compiling information on what makes people get up and keep going after failure. Or why they don’t. I’m only a few chapters in, but there are so many things relevant to my journey I’ve already learned a lot. This is not a Christian book, although the author does reference faith and spirituality at times. But for those of us who struggle with a less than perfect background, living with the cloud of misplaced shame or guilt, her words are especially powerful and hopeful. The concepts she addresses are things my therapist has actually been helping me learn also. One of the biggest ideas for me has to do with owning your story. What does that mean? I think it means we do what we think is expected, or what we’ve come to believe about ourselves based on all the things in our past, good and bad. If we try to gloss over, or ignore the not so pretty parts, then we can’t really respond in reality. Which means we are probably not going to respond in love. I would add one thing that Ms. Brown doesn’t mention. Ultimately, it’s not even our story. It’s God’s story, and we just get to be in it. It’s all grace! He even writes what we think of as the “ugly parts” not to hurt us, but for us! He is always a good Father, and Romans 8:28 is true. He is writing the story, for our good and His glory, to make us like His Son. If we try to rewrite or ignore part of it to suit us, we can miss out on seeing how He will work all things together for good. Previous PostPeople might. God won’t.